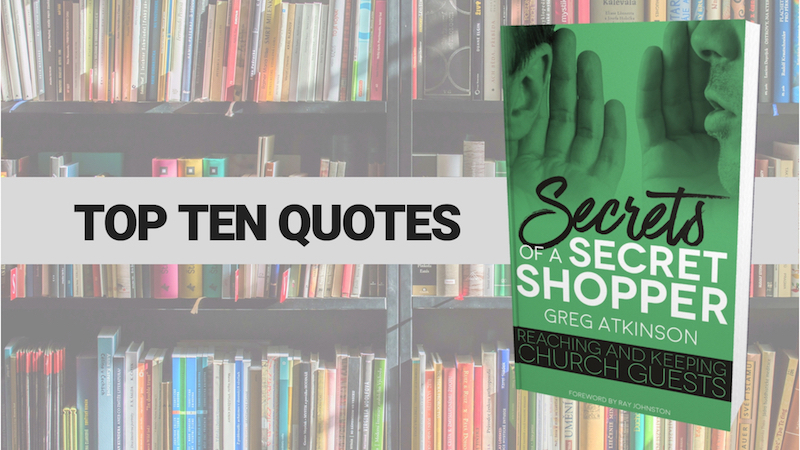 Greg has documented much of his observations in his great little book Secrets of a Secret Shopper: Reaching and Keeping Church Guests. Eminently practical in his approach, each of his ten chapters focuses on a different aspect of the guest / worship experience, from your website to parking to signage to security. While hospitality may sometimes be perceived as a unique gifting for some people, Scripture is clear that loving strangers is a biblical mandate for anyone who follows Jesus. Guests will visit you online before they visit you in person. Count on it. …many churches across the country ignore or don’t take seriously their online presence. Some churches give off a funeral home vibe. Some churches seem vibrant or exciting. Some seem inviting and welcoming. There’s a reason new churches don’t have graveyards next to the church anymore. It gives an impression – a negative one. In far too many churches, leaders and pastors put their leftovers on the First Impressions Team. … [The volunteers] feel they are doing the least important ministry in the church. Nothing could be further from the truth! Our sense of smell profoundly plays into what we perceive (first impression) and how we make judgments on the experience (will we return?). Never assume people know anything. Every room where children learn and play must be safe. This is a simple concept…If your room is not safe, I’m not leaving my kid. Usher responsibilities do not end once people are seated and the service starts. The usher should be ready for anything throughout the entire service. …there’s nothing worse than walking into a service before it begins and having to sit through the worship team finishing up their rehearsal. You don’t want to stand behind the pulpit each week and exhort your people to smile and shake hands with those around them. You will come across as forcing the issue. If your guests return for a second visit, you’ve won 80% of the battle, and they are much more likely to make a decision for Christ.